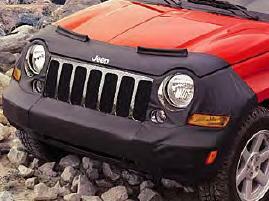 Front End Covers for the Jeep Liberty help protect the vehicle from bugs, dirt and other road debris. Designed to securely fit the contours of the front end, this high quality cover features two-piece construction to allow the hood to be opened without removing the cover. Black vinyl material with 22-ounce foss polyester backing will not harm painted surfaces. 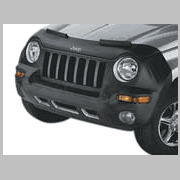 Black, with Jeep logo, with or without license plate opening. Please review model year and cover type below and select item number from list above.